What SuperSaas Triggers and Actions are Supported? Credit Purchase - Triggers when a user buys something in your shop. New Form - Triggers when a stand-alone form is submitted. New User - Triggers when a user creates a new user login. Change Appointment - Triggers on a new, changed or deleted appointment. Send Mail - Triggers on email. Switches off regular sending. New Appointment - Triggers when a new appointment is created. Reminder or Follow Up - Triggers on a reminder or a follow up. Change User - Triggers on a new, changed or deleted user. 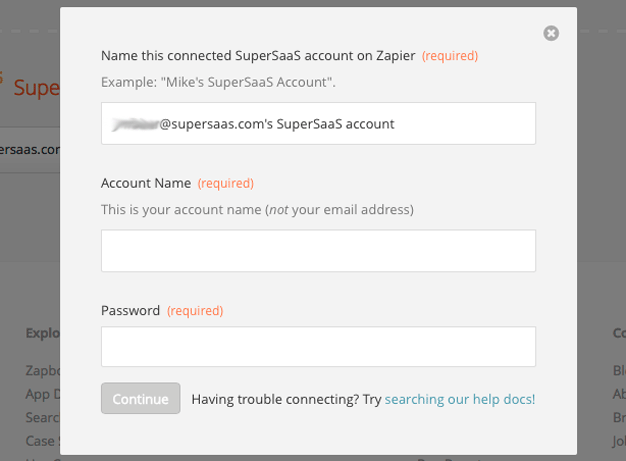 When you start creating a Zap that includes SuperSaaS, Zapier will first ask you to connect to your SuperSaaS account. Please enter a SuperSaaS account name and the administrator password, do not enter the administrator's email address. You can connect multiple SuperSaaS accounts, including free accounts, and Zapier allows you to label them so you can easily re-use them later. The name is for your reference only, it does not matter what you name it. Zapier will verify the account credentials with SuperSaaS and if everything is OK you can continue creating the zap. Yes, webhooks created through Zapier are available to free SuperSaaS accounts. Manually created webhooks that connect without using Zapier are only available to paid SuperSaaS accounts. The "Change appointment" trigger will trigger upon any change made by anyone. This includes changes made to it by the administrator including, for example, deleting an appointment or moving it out of the trash. It also includes automatic changes, such as payment status change or a placement from a waiting list because a spot became available. For this trigger to be useful you will want to filter it on the "event", "role" and/or "status" fields. The "event" field will take a value that is one of create, edit, place, pending, destroy, restore, approve or revert. The "role" field will have a value of 4 or more for a change made by a superuser or the administrator. More details on the values of these fields can be found in the SuperSaaS documentation. SuperSaaS schedules can be configured to either require signup before making a booking, or to allow booking directly without any log in. If a schedule does not require the end-user to sign up then you will never see a "New User" trigger, just a "New Appointment" trigger.